Labour leader Jacinda Ardern has very firmly locked in her position on medicinal use of cannabis, a succinct answer in a debate strongly paralleled by National leader Bill English. In the TVNZ leaders debate, both were asked to answer in 30 seconds whether they would legalise cannabis for medicinal use, for pain relief or extending life. Ardern has failed to deliver. They can use it now – and hope the police won’t prosecute them. That’s about all Clark could offer with the Government bill. Pearl Schomburg has been using cannabis to manage her pain for the past two years. She suffers from inflammatory pain, PTSD and nausea, but access to her chosen medicine won’t be any easier under the planned law change. “There’s nothing in it for me today except hope that this is just the beginning. “There’s a lot of disappointed people in the community, some of them are quite angry as well because they feel like they’ve been quite let down by Jacinda [Ardern]. Health Minister David Clark said in time the legislation would result in greater supply of quality medicinal cannabis, including products made in New Zealand. When the new scheme is operational, patients with a prescription will be able to access medicinal cannabis at a pharmacy. But Auckland woman Joan Cowie, who has stage four lung cancer, doesn’t have time to wait for that to come into effect. “They’re saying on the news you can go to the pharmacy and get your products there. Ms Cowie said the bill didn’t help people who weren’t interested in pharmaceutical cannabis, including herself. She said she preferred the organic product and couldn’t afford to buy pharmaceutical cannabis. Ms Schomburg said many users felt politicians were not taking their pain seriously. “I and many other people cannot afford pharmaceuticals so shall we just sit here and wait for five years until the prices drop, and then are we allowed compassion? She said future legislation should focus on patients, not pharmaceuticals, and provide immediate, affordable access to high quality organic cannabis. Royal New Zealand College of General Practitioners president Dr Tim Malloy says many doctors have patients who want to try medicinal cannabis. He says the subject has divided those in the medical field. Medicinal cannabis is already available on prescription in New Zealand. However, experts like Dr John Alchin from the University of Otago say there’s little or no evidence it works. “It’s not a silver bullet, we all wish there was a silver bullet for chronic pain,” says Dr Alchin. While cannabis may not reduce pain, it could have other effects. “If people have high expectations, there’s a placebo effect that comes in and a lot of people respond to a placebo,” he says. Odd comments. If people with chronic pain feel better after using THC then surely that makes it effective? That’s why they use it. People with chronic pain, mental illness and chronic and serious non-terminal illness currently use alcohol to mask pain, and this can have more serious adverse effects than using cannabis. Clark struggled to explain the toothlessness of his bill on RNZ this morning, but said he would vote for Chloe Swabrick’s bill that would actually promote actual change. Ardern has also said she would vote for Swarbrick’s bill – it will be a conscience vote. Prediction based on informed advice: there will be no immediate or significant increase in access to cannabis based medicines as a result of essentially cosmetic government legislation. It’s all about the 100 days commitment rather than doing anything substantive. Sadly, I think he is right. It is sort of an improvement on the current law, but in practical terms it is far more political window dressing than practical or meaningful change. This Act amends the Misuse of Drugs Act 1975 (the principal Act). An amendment to the act is notable, but it is largely symbolic. It has been pointed out that 98% ‘pure’ CBD is likely to be difficult to extract from a complex plant with many chemical components, and is likely to be expensive to manufacture. Dying people are theoretically given an exemption from illegal cannabis use, but in practice it will be difficult or very expensive to obtain product. (1) In section 7(2), replace “subsection (3)” with “subsections (2A) and (3)” . (b) has a certificate from a medical practitioner or nurse practitioner certifying that the person has a terminal illness. That sounds ok for people who are certified to be dying, but excludes people with severe medical conditions or pain. (3A) In any proceedings for an offence against subsection (1)(a) in respect of possessing or using any plant or plant material of the genus Cannabis, any cannabis preparation, or any cannabis fruit or seed, the defendant may provide evidence that, at the time of the possession or use, the defendant had been diagnosed by a medical practitioner or nurse practitioner as having a terminal illness. A dying person can posses or use cannabis, but they can’t get it legally – it is illegal for anyone to supply them. So what do you do if you are told you have 6 months to live – find some seeds without anyone supplying you, and hope the plants grow before you die? (1A) However, in any proceedings for an offence against subsection (1)(a) of possessing a pipe or other utensil (not being a needle or syringe) for the purpose of possessing or using any plant or plant material of the genus Cannabis, any cannabis preparation, or any cannabis fruit or seed, the defendant may provide evidence that, at the time of possessing the pipe or other utensil, the defendant had been diagnosed by a medical practitioner or nurse practitioner as having a terminal illness. Again, allowed to have a pipe or utensil, but somehow you have to get it. (b) that may be manufactured, imported, or supplied under a licence granted under this Act. The Minister can determine standard – that may be a good thing or a bad thing. So what does all this mean? Probably not much – it is still difficult or expensive to obtain cannabis products if you are dying, and still illegal if you suffer from chronic pain or some other serious ongoing medical condition. The Greens have agreed to support this bill, but are still proceeding with a Members’ Bill that will have a go at making real change. Jacinda Ardern has said that via a conscience vote she will support the Green bill, which is hardly a vote of confidence in this bill. I’m a long way from Auckland so am relying on the live stream. Which has been delayed, so have to wait until that starts up “soon”. War Memorial Hall appropriate, commemorating fighting for freedom. 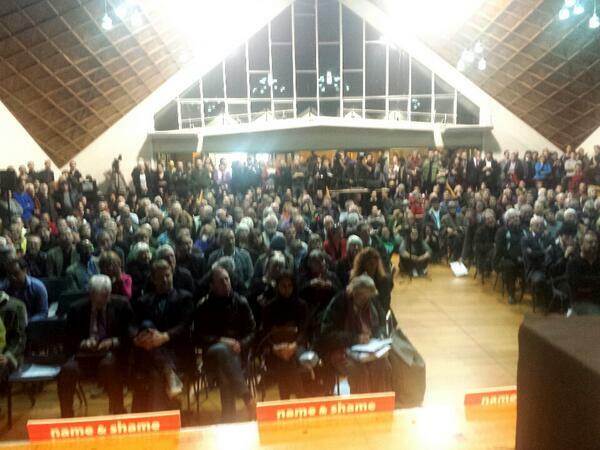 Gosh, this isn’t even everyone who has turned up for the anti GCSB bill meeting in Auckland tonight. Taking a while to get to the point. All of these defects come to a head in the GCSB Bill. All of the authorities that have looked at the bill have said it should be shelved. Democracy is not a partisan matter. As for the Prime Minister – we send them to parliament represent us, not rule us. Very eloquent, but a slanted view. Look at it as it stands and with the proposed changes. Dunne deal. MPS – show some backbone. Actions are covert, only if there is a muckup do we find out. As a lawyer, if you are going to increase their powers you must increase scrutiny. This legislation is hopelessly broad. We need a fully informed national conversation. The debate needs to take into account and understand current and future technology. Much of this debate is probably barking up the wrong tree. Streaming is very good quality. MPS making the decisions are as ignorant as us, how can we make laws like that? Open slather on New Zealanders. If you accidentally intercept private communication it’s ok. I think the committee report addresses this. I contend that these are substantive changes. What this is really about (conspiracy theory) – Waihopai data collection will be shared with other agencies. Dunne deal. None of them are substantive. All of them are window dressing. I think that’s an unfair dismissal. You can have as much oversight as you like but if the powers are loosely framed and if the interceptions are authorised then the oversight is too late. History tells as that once given power is only ever added, not taken back. None of the Dunne deal should be any consolation to the public of New Zealand. Big turnout, I’d guess 1000+, at GCSB bill meeting in Mt Albert. Full to brim. I’m a living example of why the GCSB shouldn’t be given greater power. What imaginary threat is keeping John Key awake at night? Would it be safe with less security? The access to a massive spy could is the biggest weapon yet. The GCSB is basically a subsidiary of the NSA. There is reason to believe this bill is being handed down as a dictate from Washington. Insufficient checks and balances. Clearly flaws that pose great danger to the nation. Dotcom is making a lot of assumptions and guesses. It’s clear the GCSB needs more thought and consideration. There’s a question of trust. If we don’t seize this unique moment to reform our spy laws we will live to regret it. The new GCSB bill is morally indefensible. The GCSB bill is a greater threat than terrorism. Others say “beware the spies”. Civil liberties are vital to democracy. The GCSB bill is not unique to New Zealand. Keeping up means mass spying. Mass surveillance is what happens when a government is scared of its people. We the people get to decide if we want mass surveillance. Explains how much can be revealed by metadata. Superconveniently metadata is already in a readily usable form. You can now draw conclusions about anyone in the country, about everyone in the country. There is no doubt that metadata is essential in modern surveillance. Dunne’s amendments don’t change any controls on metadata. It is still not addressed. Any intrusions must be minimal and essential. But Key says there is and will be no mass surveillance. It’s not my job to prove we don’t need this surveillance, it’s your job to prove that we do. Privacy seems to be a normal human need. Privacy used to be negligible. Mass surveillance is partly about power. Maybe it’s not going to happen now maybe it’s not going to happen in the future, but we shouldn’t give government the power in case they use it in the future. We need clarity. The bill should be clear if it goes ahead. Prepared to accept some surveillance but these need to be limited, the minimum required. Penny made the meeting aware of a private prosecution against John Key for spying on Kim Dotcom. Once data is collected there are no limits on what can be done with the data. I think the committee report addresses that. Kim Dotcom – they store all your communication data and can access it. They are capturing all data. Not according to Key. Some claims are grand speculation. Shearer is there and put on the spot. Someone asked if opposition parties would repeal it if they get into Government. Cunliffe must have been seated near the front, he wouldn’t have seen Shearer arrive late and stand at the back. David Parker standing beside Shearer. Green’s Browning says the bill is a total sham and invites everyone to join him at Waihopai at 2pm on Sunday. Is it time for a third major party to represent middle New Zealand? Is there a legal way to get this law dissolved? Use vote at next election. Chair asks for no more political questions/comments. 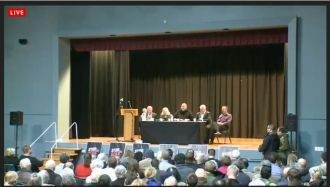 Joe Carolan launched into a speech (way off the topic)and the chair refused an answer with some crowd support for his stance. Rodney Harrison suggested everyone lobby their MPs to vote on their conscience, but said they have no knowledge to base a vote on. Some have. Martyn Bradbury promotes the march on Saturday and says that when 50,000 march it makes a difference. Very interesting. The speeches were all good, eloquent, many pertinent points, but quite a few assumptions, guesses and probably a few overstatements and dubious claims. Thomas Beagle made a brief reference to the committee report and said it made little difference, I’d be interested in more in depth analysis of that in conjunction with the Dunne amendments. I think Key still has to do substantially more clarifying. The meeting had an obvious political slant. Peter Dunne is still the focus of most of the venting and abuse- 1/121 of MPs is getting 120/121 of the flak, and he’s done more than just about any MP to try and address shortcomings in the bill. The live stream is now repeating so I’ve just watched the start of the introduction. Yet more piling on Dunne. It could be a pressure filled week or two for him. Karol: So, Cunliffe committed a Labour-led government to repeal the Bill?! Weka: Looked like it. Interesting move at this point in time. If the Labour caucus have actually discussed this and reached that conclusion, then why aren’t they putting out press statements? Good to see Shearer at the meeting, but the cynic in me thinks it was for the wrong reasons. I can’t decide whether I wish he had been able to answer the questions or if it’s better that he didn’t. The two most under pressure politicians, Shearer and Dunne. Repeal is certainly different to anything I’ve heard Shearer say. Following democratic process was talked about a lot at the meeting. I wonder what democratic process Cunliffe used there. Contrary to the assertions of opposition parties, the changes Prime Minister John Key has made to the Government Communications Security Bureau bill are not merely cosmetic. All these changes make substantial modifications to the bill as it was first presented to Parliament. All these changes make substantial modifications to the bill as it was first presented to Parliament. While they have not been enough to persuade opposition parties to support the bill, they are sufficient to satisfy Peter Dunne, formerly a strong critic of the bill, which means it will pass. The fact is the changes were proposed by Peter Dunne and agreed to by John Key. Questions about the operations of the GCSB and, in fact, the whole intelligence and security apparatus in New Zealand, may, however, linger. They will always linger for some people, who want no spying from anyone on anyone. Possibly the most important provision in the new legislation will be the one providing for a review of the GCSB’s activities in two years and regular reviews thereafter. The threats the GCSB and other intelligence agencies are meant to guard against are, in today’s hyperconnected world, rapidly evolving. Boundaries that were once hard and fast are dissolving. The agencies and the laws governing them must evolve to meet that reality. So, too, must the oversight of them. John Key still needs to deliver on his promise to make it clear as soon as possible and in legislation that “the collection of metadata will be treated as communication and require a search warrant”. Peter Dunne alone appears to have done more to tidy up the GCSB Amendment Bill than all other MPs combined yet he is copping most of the flak, criticism and abuse for not doing enough, or for doing anything. Dunne has done what any MP (or party) should do, he has worked with Government on improving a bill that many claim is of utmost importance for the security of the country and the privacy of the people. He has initiated significant improvements. But because he hasn’t re-written the entire bill on his own, or because he hasn’t halted the bill, or because he hasn’t done nothing, Dunne is heaped with scorn, abuse and ridicule. Dunne has compromised on his ideals (he prefers the GCSB did not spy at all on New Zealanders) to achieve significant gains, and he is vilified and accused of flip flopping and u-turning. While the other parties do nothing because they can’t get their own way, or because they can’t be bothered actually contributing positively to the parliamentary process. Such is the pissiness of politics and the press in New Zealand. Campbell Live wanted to ask him today, but he was too busy doing whatever he does to be interviewed. So reporter Rebecca Wright looked at the press conference he gave yesterday in search of an explanation. And then she pissed on Dunne with what looked like petulant punishment for not playing along with her story. Andrea Vance, who often wears an excellent journalist hat, replaced that with her ‘opinion’ political activist hat and expressed her displeasure at Dunne not delivering everything she wanted. In Dunne turnaround on spy bill Vance sounds pissed off and pissy. She should remember that she has not been elected, and I’d be surprised if she’s a member of any party. A personal crusade seems to have usurped her professionalism. Campbell’s impartiality, accuracy and balance wasn’t even token. But he does also take aim at Winston Peters. On national security issues, it is hard to see Peters standing resolutely in opposition alongside Labour and the Greens. Resolutely in opposition. Labour and Greens. That’s obviously what Campbell wants but it’s hardly what we are getting. Russel Norman is sort of sounding principled and is unlikely to ever have supported the bill. But his line is nothing more than if the Government won’t do it his way he will do nothing else but oppose and criticise. Nothing positive to contribute. David Shearer is similar but doesn’t even sound principled. If there was ever a time for Shearer to show leadership, if there was ever an opportunity to step up and show he could lead the way to a decent cross-party solution, it is now. But as usual he recites a few worn out phrases and adds nothing useful. Oh, he has replaced his head of staff. If only he could replace what’s in his head. Winston Peters has done what he usually does, harrumph and complain and try to diss Dunne some more. But nothing to contribute. The Maori Party? I emailed Te Ururoa Flavell asking what their position was but no response. Maybe they don’t care if the GCSB spies on Maori. Hone Harawira has complained about the GCSB in the past, but at the business end of the bill where is he? Act leader John Banks has secured a change to get a set of principles written into the bill including the requirement for the GCSB to have regard to the Bill of Rights Act 1990, which protects New Zealanders against unreasonable search and surveillance. He could have tried more but that’s something worth having. But the main opposition parties won’t get their way so won’t do anything but oppose. But Labour and New Zealand First, who wanted a more immediate review, last night remained adamant that they would oppose the bill, and it will pass with a majority of just one. The Greens called the changes cosmetic and will also oppose it. And piss on Peter Dunne. They criticise the one MP who has worked hard to secure useful improvements to the bill. While they contribute nothing but bitching. One MP does more than 120 MPs combined, and cops the blame and vitriol for the failure of others to front up. Petty party posing and point scoring seems more important to Labour, Greens and NZ First than security of the country and privacy of the people. So Dunne is done over for doing what any decent MP should do. Occasional Kiwiblog commenter and ex Labour insider ‘kiwi in america’ responded to a comment suggesting that many people are nervous about the GCSB Amendment Bill. If as many kiwis were concerned about this Bill as you state then National would’ve dropped in the polls and Labour and the Greens (who have both spent probably 50-75% of their allocated questions and supplementaries in Parliament on this issue over the last year) would’ve gone up. Opponents are playing a zero sum game as if they want to litigate the legality of even having any agencies with any capacity to spy at all. Spying on those deemed to be at risk to the state has gone on since the Elizabethan era. In modern democracies the key is to weigh security issues with privacy issues. The bill did go a little further than the tidying up of the messy 2003 law passed by Labour in allowing the GCSB to possibly assist agencies beyond those who had previously needed assistance (SIS, Defense and Police) and Dunne has used his leverage to, rightly IMO, move that contentious issue back into the hands of Parliament. That’s responsible legislating and what good MPs have done for centuries in the Westminster system. In the post 9/11 era, a majority of NZers would support the right of the state to spy on people (citizens or foreign nationals) inside NZ who may pose some threat. There will always be tension between those who believe it is their human right to be dangerously subversive and a majority who think that certain views and actions are potentially injurious to the well being of the broader populous. The differing opinions over the rights and wrongs of the Ruatoki arrests and the activities that were the subject of Police surveillance are a good example of this. NZ does not expend large sums on its security agencies even on a per capita basis compared to the US, UK and even Australia. The convention that the surveillance capabilities of the GCSB be shared with other agencies that might have just and legally warranted cause to spy on someone makes sense in a small economy in times of budgetary constraints. This law takes away any legal ambiguity over what had become a bi-partisan consensus over allowable assistance. There has been boatloads of cheap politicking over this issue most particularly from Labour. One expects the Greens (whose caucus used to comprise of people that the SIS likely DID spy on – like avowed Communist Keith Locke) to adopt an aggressive anti American anti any surveillance stance since they never met a rogue regime they didn’t want to appease. Labour has been in government and some members of its front bench received threats assessments and briefings from the very agencies they now love to vilify. Clark and Cullen were an absolute closed shop in Parliament when security agency issues came up and drew the line at this type of politics when last in opposition in the 90′s. In the absence of major traction on other issues that could raise their poll ratings and given their recent propensity for political own goals, it comes as no surprise that Shearer and Labour won’t want to let their ability to grandstand on this issue a little longer slip away. (iii) things like the man ban and the nanny state rubbish DO break through with lower information voters and always to the detriment of the parties on the left so enamoured of gender politics and political correctness. There have been many claims made about how the GCSB can (or wil be able to) gather metadata and deliver it to the NSA in the US. Most insidious is that the law allow for entire categories of people to be trawled for metadata. Bradbury is organising an “Urgent Protest Meeting” on the GCSB in Auckland on Thursday night and a protest in Auckland on Saturday. His posts this weeks are paranoid or scaremongering, possibly both. This doesn’t give his protests much credibility. Peter Dunne has secured an agreement with John Key to clarify the issue of metadata. This review will include the definition of private communication (and metadata) to ensure a standard definition is developed for insertion in the GCSB and NZSIS Acts, and all relevant legislation such as the Crimes Act and the Search and Surveillance Act. Mr Key said the amendments were “significant and sensible”. He insisted information collected by the GCSB would not be misused. “There is no wholesale collection of meta-data, on some sort of fishing expedition, that’s currently undertaken by GCSB nor will there be in the future,” he said. Mr Key said today that he did not believe that the GCSB had engaged in the mass collection of metadata and he confirmed that it should be treated the same as communication and any collection of it would require a warrant. He planned to make a clear statement about it in the bill’s second reading. It will be interesting to hear what Key has to say then. There was predictable criticism of Peter Dunne following his announcement that he would support a significantly modified GCSB Amendment Bill. One source of the dissing and hissing was from those who complain bitterly about Dunne no matter what he does, they are bitter and twisted about Dunne being an MP and will moan about him at any opportunity. The diss Dunne if the sun rises and the diss him if it sets. It’s quite obvious to almost everyone that Dunne is grandstanding on this to distract the public from his recent philandering and the only people who don’t get that are the less than a thousand idiots in Ohariu who will give him their vote. And I doubt that even their collective IQ would total above 70, which makes all of them hovering between Borderline deficiency and Definite feeble-mindedness in Griff’s helpful scale above. And they’re the only people in Wgtn who don’t see straight through Dunne’s pathetically transparent pretence that he gives a flying about privacy. They tend to hate the fact the Dunne has any political power. They hate Dunne. They hate. The other main source of Dunne disapproval are those who were opposed to Dunne normally anyway but conveniently hoped he would do what they want on ther GCSB bill – oppose and kill it. Most of them not only oppose the bill even if it might improve on the current legislation, they oppose the GCSB, and they oppose the SIS. They probably also oppose any undercover police action as well. Through his actions Peter Dunne has become the single most corrupted personality in our political history. Because he wouldn’t do what she wanted. Such is the nature of extreme politics – lefties and righties who want extreme solutions and have extreme reactions when they don’t get their way. Which is most of the time, because mainstream MMP politics will never deliver their political fantasies. I’ll wait to see more considered opinions on the Bill changes – I’m especially interested in what those who had serious and considered opposition to the bill, like the Law Society, Tech Liberty and InternetNZ. And David Farrar has just posted his approval at Kiwiblog – GCSB Changes. Dunne and Banks have shown how you can have a constructive role in improving legislation. The sun will rise soon. And a bitter few will churn and burn on Kiwiblog and The Standard for another day.